Following on from Monday’s guest post by Emma Carroll, I review two recent children’s novels that draw on classic literature. 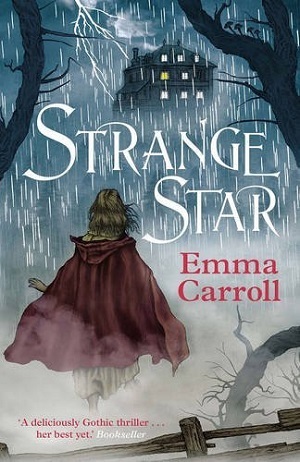 Firstly, Carroll’s own novel, Strange Star, inspired by Mary Shelley’s Frankenstein. A modern day Frankenstein draws together so many elements – from the inspiration of classic literature on today’s contemporary writers, to the teaching and love of science for young people, and in particular, girls (STEM reaching out its tendrils to young females) and also our modern obsession with the treatment of ‘other’, which is something that, believe it or not, has existed since the dawn of time: whether what is different is perceived as monstrous simply by the fact of it being ‘other’. Strange Star begins in June 1816 with a group of friends gathered at a villa on the banks of Lake Geneva, telling each other ghost stories. It was where Frankenstein was reputed to have been imagined by Mary Shelley as she listened to stories from Byron and Percy Shelley. Carroll uses the scene to build tension and atmospheric chill, when a thudding at the front door reveals a strange, half dead child who, on awakening, proceeds to tell her tale. She is Lizzie Appleby, a village girl from England who speaks of strange happenings, lightning strikes, the disappearance of animals, and the strange goings-on at Eden Court near her house, where a scientist is experimenting with lightning. By the end of the book, the connection is revealed, but there are spooks and thrills along the way, and some canny plot weaving. As in Frankenstein, Carroll repeats the narrative within a narrative framework for her tale, but she goes further than simply using the inspiration of ghost stories and internal narratives. She has cleverly played on so many of the themes buried within the original text, from the use of fire, not only in a final denouement, but also in the lightning strikes, to themes of sight and light – light providing opportunity and yet also danger, and a lack of sight providing the most insight. Carroll’s characters are vividly imagined, and although our first narrator is a boy, the bulk of the novel is Lizzie’s narrative, and she tells of the women who surround her. Throughout the story, the strength of women shines through, despite the historical context and the struggle they must surmount to prove themselves. From women and their relationship to motherhood, to women who are prepared to work hard and sacrifice themselves in the process, to the women of science who need to prove they are as good as their male counterparts. All in some way sympathetic characters – even those, who like Dr Frankenstein, push themselves too far in blind ambition and forget to think of what or who they may be hurting along the way. The other point of view in Strange Star (in third person) is that of Felix, Lord Byron’s servant, who is also richly portrayed, and intensely simpatico, despite his own difficulties in the face of his ‘otherness’. Carroll draws together the historical implications of all these people with their differences – be it gender or race or disability – and shows how strength of spirit and tolerance can forge through. The writing flows as with all Carroll’s novels; the descriptions are visceral and explore all the senses, but more importantly the plot is meaty and intense. This is storytelling at its very best, and with a deliciously haunting feel to it that readers will savour long into the night. Age 12+. You can buy it here. 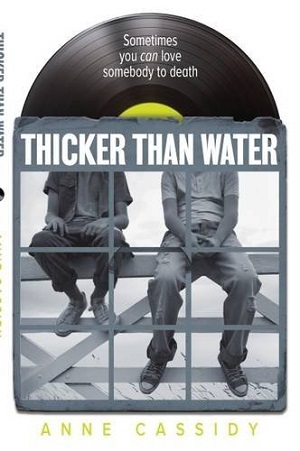 Anne Cassidy attempts to get even closer to her original text, this time Of Mice and Men by John Steinbeck, by recrafting her take on the story in Thicker Than Water. George wants to run a record shop, with just enough money to get by. But he has Lennie to look after too, and despite his size, something about Lennie is not quite right and he certainly doesn’t recognise his own strength. So it’s inevitable that before long Lennie will lead them both into trouble, and with the sort of people they’re working for – the trouble will be deep and dangerous. Of course the problem with tackling such a meaty book by an author such as Steinbeck and condensing the word count so significantly is that there isn’t time for a slow wallowing immersion into the complexity of the characters and their relationships to each other. Steinbeck spends a large portion of his novel focussing on male relationships; a brotherly connection of protection and idealised friendship. This is what makes his tragic ending so poignant and heartfelt. Although Anne Cassidy’s also feels emotional, I think it’s a stretch to achieve quite such a wrench in a condensed novel. There’s a languorous world-weariness in the original text, a reality come to bare that the American dream is all but an impossibility. In Thicker Than Water, George also seems to realise that his dream is probably unattainable, but the philosophical life-learning lessons to reach this realisation – anguished over in Steinbeck, is harder to pull off when reducing the age of the protagonists to teens, as Cassidy does in hers. Although some of the moral ambiguity is stripped out, Cassidy has interpreted Steinbeck’s original thoughts on the economic turmoil and societal breakdown in America beautifully by positioning her own English characters within a pub, where a host of figures explore the lack of opportunities afforded them, and instead wallow in crime and social exclusion. This is clever and effective. Cassidy also draws out the central premise of loyalty, and maintains some of the original themes, such as the natural world, the premise of loneliness, and the dogs. This is a good standalone novel, or a companion piece to Of Mice and Men. There’s a quality to the text that’s dramatic, filmic even, and I could happily watch a stage adaptation of Cassidy’s too. Age 12+. You can buy it here. Whether the reader approaches the books in ignorance of the original sparks of inspiration, or reads them as complementary novels, these are both well written, memorable novels. For me, it bumped the originals back onto the To Be Read Pile. But I’m glad I read the classics while young, for “the companions of our childhood always possess a certain power over our minds which hardly any later friend can obtain.” Thanks, Mary Shelley. With thanks to Simon Lister for his valuable insight on OMAM.